With just two days before the presidential election, WikiLeaks late Sunday night published a new trove of emails apparently hacked from the Democratic National Committee (DNC). The most recent dump of more than 8,000 emails came after the whistleblowing site, on a daily basis over last four weeks, has already leaked over 50,000 emails stolen from the key figure in the DNC – Hillary Clinton’s campaign chairman John Podesta. However, this time, not everything went as planned by WikiLeaks. 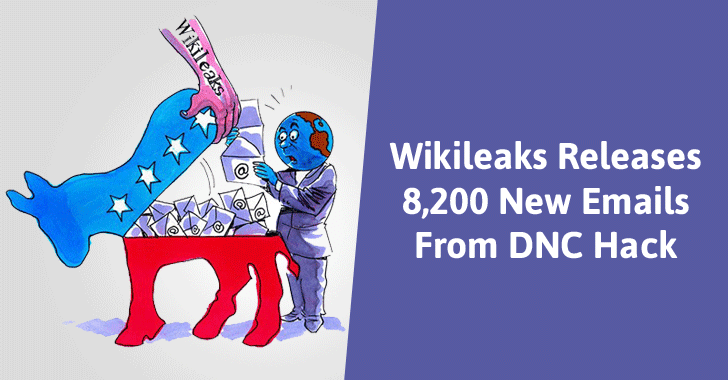 WikiLeaks early Monday morning announced on Twitter that shortly after the release of hacked DNC emails the organization was the target of a major Distributed Denial of Service (DDoS) attack. Soon after WikiLeaks reported the DDoS attack on its email publication servers, Twitter also went down, and the outage lasts for at least 30 minutes. According to a status monitor, the Twitter outage began at around 6.45am GMT and continued for nearly half an hour, though reports suggested that the impact vary from user to user and many users were still experiencing issues in Japan over a couple of hours later. "We are still under a DoS attack on our e-mail publication servers, and it appears that Twitter is down as well, we are unable to confirm if this is an attack on Twitter at this time." WikiLeaks Down! Twitter Down! Any Connection? At this moment, there is no connection between both the incidents, although some Twitter users quickly linked the two outages. "Twitter went down because Wikileaks released #DNCleak2 It has begun! They are trying to suppress the truth from coming out!! !," a Twitter user said. "So Twitter was down due to the #DNCLeak2 released by @wikileaks – we should be worried, global censorship is heading our way," another user said. One of the leaked emails saw former Clinton Foundation fundraiser Doug Band slamming Chelsea Clinton for allegedly spending funds from the Clinton Foundation to help pay for her wedding. Earlier this year, the FBI argued to investigate the Clinton Foundation for potentially giving donors special favors and political access, but just yesterday, the agency cleared Clinton of any criminal wrongdoing after a review of the latest trove of her leaked official emails.